Hey look at that! I FINALLY have a book review on here again. I just read this book this weekend and have been reading through it this month with Briana Morgan and I just finished it this weekend! 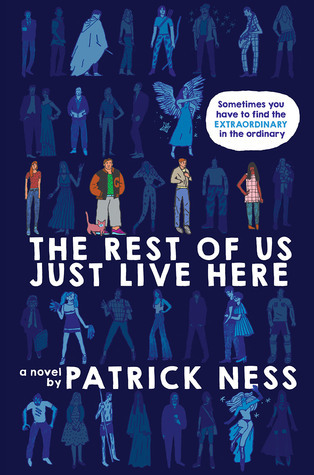 I really enjoyed how The Rest of Us Just Live Here strayed away from the cliche ‘Chosen One’ plot and decided to take a look at well… ‘The Rest of Us’ or rather the ‘innocent bystanders’ in a novel with the Chosen One plot. It definitely was not one of my favourite Patrick Ness novels (I’ve only read one other so far but have one more on my TBR pile) but I still enjoyed it. I loved the idea of the two story lines and focusing more on the background characters as opposed to the ‘chosen ones’ but I enjoyed how you still knew what was going on with those characters at the same time. I loved how that were just normal people as the main focus. Normal people with real and honest problems. Especially mental illnesses. Now I’m not saying that because I like to see people suffer but because I have struggled with some mental illnesses (yah, its honesty time here) so I like to be able to feel a connection that way and go: ‘Oh! I know how that is.’ gives me more of a connect with the main characters. The main characters were fantastic by the way. They were all so unique and amazing and loveable and squishable and yah. I wuv them. I just love how they casually mention things like the rebuilding of their high school and other buildings due to recent ghost or zombie attaches and whatnot. It was all so casual. Made it feel like it was all normal (which for them it was) and it was really well written. So overall I liked the book but it wasn’t a huge ‘LOVE’ on my end. Hence the 4 star rating. I couldn’t get through this, I gave up soon. Maybe I shouldn’t have, but I got bored as hell, hah. Glad you enjoyed it.